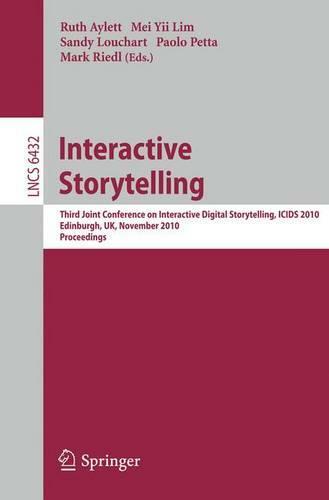 Novel pervasive, mobile, and interactive graphical technologies underlie a new mode of storytelling-interactive digital storytelling (IDS)-whether in int- active entertainment, computer games, education, therapy or other interactive digitalapplications.Thisraisesthepossibilityofrede?ningtheexperienceofn- rative through interactive simulations of computer-generated story worlds. The wide range of papers at ICIDS 2010, held in Edinburgh November 1-3, 2010, was testament to both the number and variety of researchers now investigating this ?eld. Some papers addressedkey theoreticalproblems in the ?eld: howto reconcile interactivity and narrative structure; how to make complex digital systems - cessibletothecreativeauthor;whatprocessesandmetricsareneededtoevaluate the outputs of IDS systems. Others addressed IDS in speci?c domains: in e- cation; enhancement of automated sports commentary; therapeutic approaches to trauma; location-aware presentation of culture and history; computer games. IDS systems now employ not only conventional desktop systems, but also lar- scale immersive display systems, and mobile devices; as well as modalities such as ?lm and video, which remain important sources of knowledge and experience. Inatrulyinter-disciplinary?eld,ICIDS2010servedasaforumforthediscussion of ideas, experiences and achievements of researchers with very di?erent ideas and assumptions. The ICIDS 2010acceptancerateswere24%for long papersand 46%for both long and short. This re?ects the high standards applied by the members of the Program Committee. Posters and demos rounded out the conference to create an atmosphere of interactivity. In addition, seven pre-conference workshops and tutorials allowed more intensive discussion of speci?c themes. Three keynote speakers supported the inter-disciplinaryrangeof ICIDS 2010 and the ?eld's natural ties between academic research, the arts and industry.